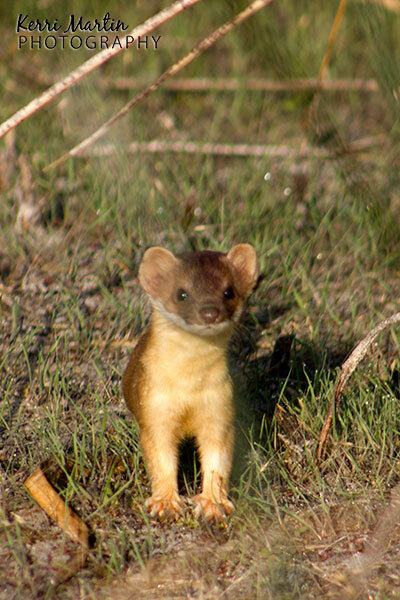 I was not aware of the immense variety of Weasels (Mustelidae) in Alberta until I got into wildlife photography. I had heard the term of course, but usually as an adjective when describing someone who is sneaky and under-handed. After learning a bit more about them, I don’t think that’s a completely fair generalization of the Weasel family as a whole, but I do see where it came from. *Find more information on all these species at Alberta Fish and Wildlife. Like with the Pika, my real-life experience with any of the weasels is limited, so I do not have much of my own material to share. My most recent encounter happened this past October. I was driving along the Highwood pass, and just past the summit, I saw a small figure scurry across the road. The long-tailed weasel (I think), went into a hole on the other side of the highway and poked his head out. I grabbed some images, then turned my car around to get a bit closer and grabbed a few more. I watched him scuttle up the bank, occasionally stopping and looking back, then disappear into the trees. 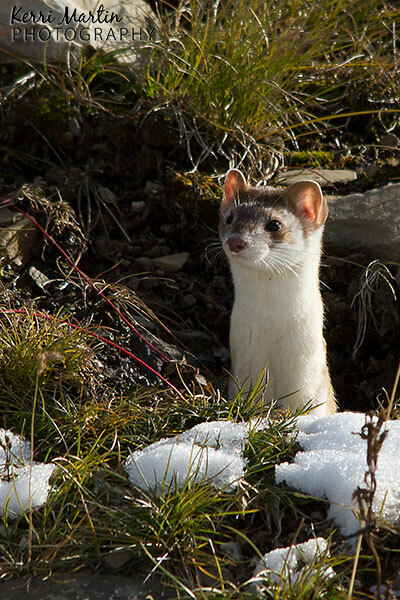 My other long-tailed weasel experience was at Frank Lake, south-east of Calgary. I was sitting on the boardwalk to the viewing platform watching for one of my favorite little shorebirds/rails – the Sora. These elusive birds are hard to see, so I’ve had the best success by sitting quietly and watching. 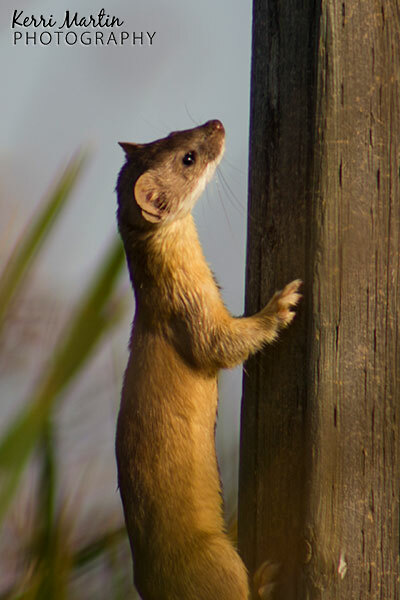 Imagine my surprise when, instead of a Sora, a weasel popped out from the reeds! He paused and stared at me for a few seconds, then ran back into the reeds. Then he surprised me again by climbing up a nearby sign post, perhaps to get a better view of this human interloper, and ran off. They are such fast moving creatures, but also seem very curious. I had brief mink encounter in (you guessed it!) Weaselhead as well. I was sitting on the side of the lagoon and heard some rustling in the grass. A critter emerged on the bank on the opposite side, slid into the water and swam past me. The images I got are not great, but enough to at least ID it as a Mink – the little white patch on the chin is a good identifier. Otherwise, my only other weasel sightings include a quick glimpse of a badger crossing the road just west of Calgary and another small weasel in Fish Creek Park. Neither of those encounters resulted in any usable images. Luckily though, I have friends who have captured some amazing images of various weasels that I can share with you. 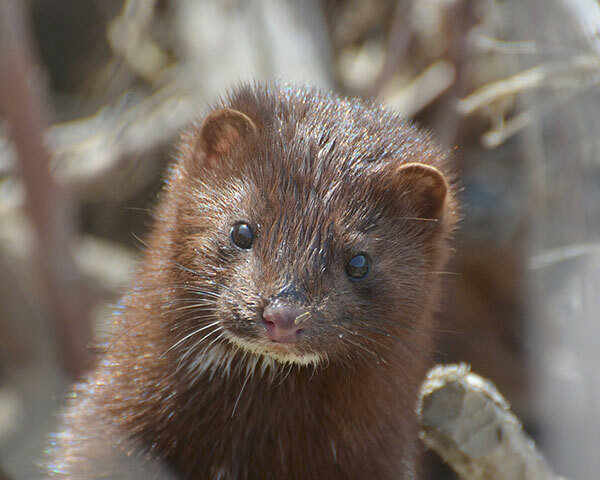 Photographer Mike Kelly has allowed me to use a Mink and Badger image to round out this post. He has an amazing series of both the Mink and Badger. I strongly encourage you to click here to view his flicker site, and scroll through the series of about 20 images by clicking on the arrow on the right. My friend Turbo captured some great images of a Marten on a recent trip to the mountains and saw a Least Weasel and five kittens in July 2012. Regarding the other types of Alberta weasels, Otters are not very common but I believe there is potential to see them in Northern Alberta. I had never even heard of a Fisher until a few months ago, and I don’t know anyone personally who has seen one. Wolverines, of course, are very elusive – probably one of the most difficult species to see in North America. A few months ago I watched an amazing PBS documentary on Wolverines and fell in love. This is a long video but well worth the watch. I think the only other creature that rivals a Pika in terms of cuteness is a baby wolverine, and in this video, you get to see a pair of brothers grow up. 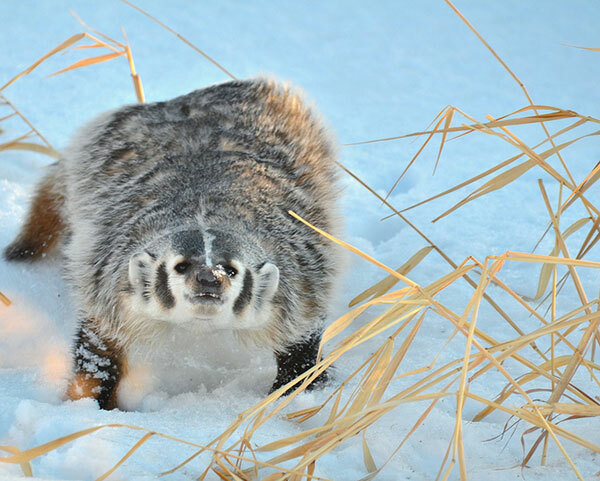 Many of the experts/researchers in the PBS video use one word to describe a Wolverine – ATTITUDE. I think that is a fitting description for all of the weasel family. They are the perfect combination of mischievous, playful and curious. They are ferocious hunters, taking down prey double their own size, or even larger. Their keen sense of survival means if they want something (usually food), nothing is going to standing their way. I really hope to get to expand my experience viewing and photographing this fascinating species in the years to come. I will, of course, keep you posted.